Marlene and Joe make these in SCRUMPTIOUS! 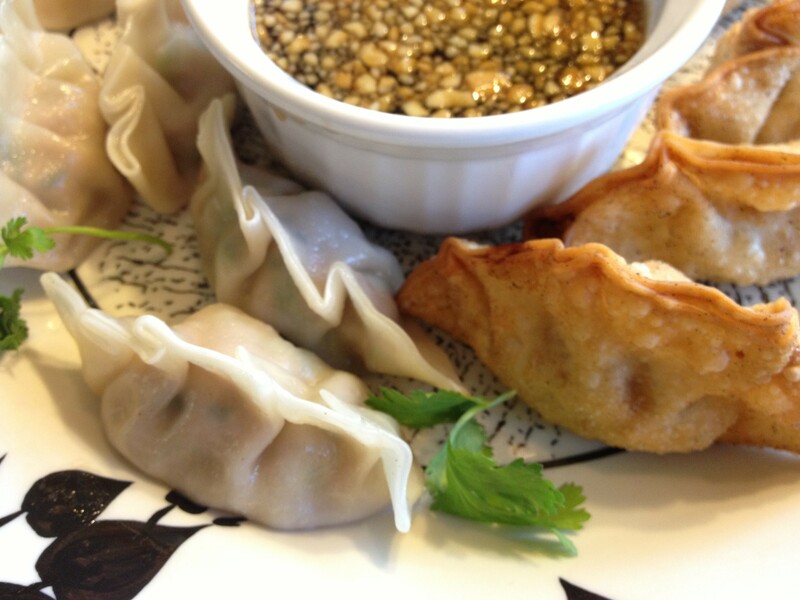 The recipe makes enough pot-stickers to stuff four people or make eight people sigh. This recipe is worth every minute it takes to stuff and fry the dumplings. It takes a bit of love to master them, but you will be loved in return by the friends who get to eat them. Serve with ginger-soy sauce, sweet chili sauce, or my favorite Sweet and Sour Peanut Sauce. Combine the pork, scallions, basil, cilantro, soy sauce, sesame oil, water and ginger root. Mix well. Add the cabbage and mix until thoroughly combined. Place one dumpling wrapper in your palm. Fill the center of the wrapper with one teaspoon of dumpling filling. Dip your finger in water and moisten half the perimeter. Fold over into a triangle. Pinch edges shut and crimp decoratively up one side and down the other. Flatten the bottoms slightly and leave them standing up. Heat 1 Tablespoon of oil in a non-stick pan over medium-high heat. The oil must be hot – just before the smoking point is perfect – or the dumplings will stick. Add as many dumplings as you can fit in a single layer. When the dumplings are golden brown on the bottom, pour about 1/2 cup water into the pan. Be careful – it will sizzle! Cover the skillet and cook over low heat, until almost all the water has evaporated and the dumplings are cooked in the middle. If they are still pink in the middle, add more water and continue to steam. Don’t let ALL the water evaporate or they will stick. Use a spatula to encourage them to leave the pan. Cook in batches and serve with Sweet and Sour Peanut Sauce, ginger soy sauce, sweet chili sauce or your favorite Asian blend!